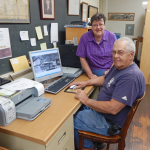 Gina Evans and Glenn Stark continue to scan thousands of photo relating to Wyoming County into the digital photo database for the historical society. The photos have been donated to the society by members and friends over the years and/or found among the holdings. Please bring or mail YOUR photos to be scanned for the database, too. Your original photo can be returned to you, while the digital copy will add to the record of life in Wyoming County. For more information, email society@epix.net or use our contact form. Meanwhile, the photo department is about to expand into a larger room, with lots of space for equipment and storage of the archived photographs.